The demo version is different from the full one solely in the fact that it works only with 12 instruments. The list is shown in the Comments. Searching for a ticker it is launched on (works the same way with "#ticker" "ticker"). 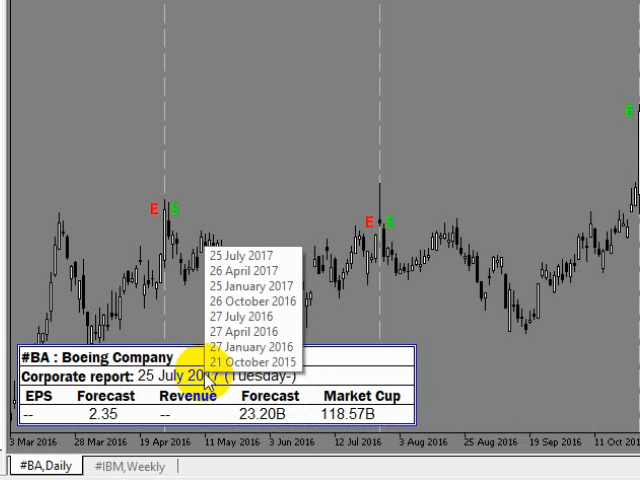 If no data are found, it offers to find # in the Ticker List and enter # manually (one-time action) in the lower left window having the # mark. If you need to change the previously selected #, click No during the company confirmation and enter the new #. 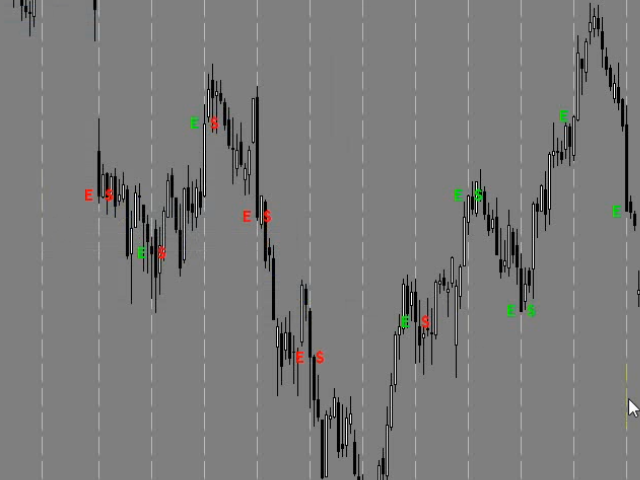 This is necessary when your broker has signed a ticker in its own way, for example _Sberbank_adr * instead of the usual SBER (you can enter the ticker manually only in the full version). Plotting vertical lines corresponding to dates of the published corporate reports. 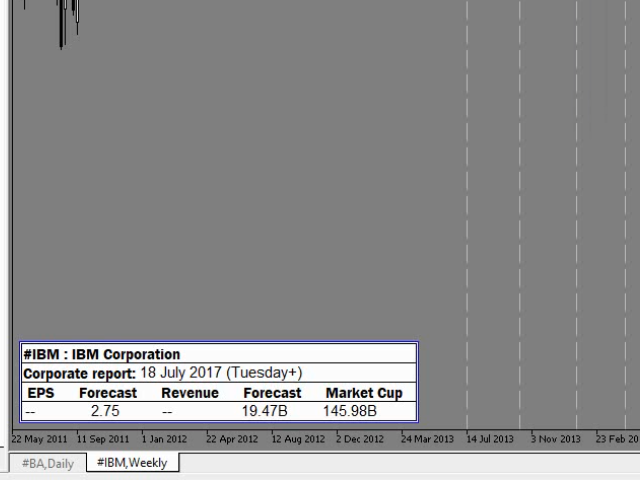 The tooltip of each of the lines contains data on the appropriate corporate report. if expectations are not met, the red one is used. date and info on the expected report as well as the one published not earlier than 5 days ago. 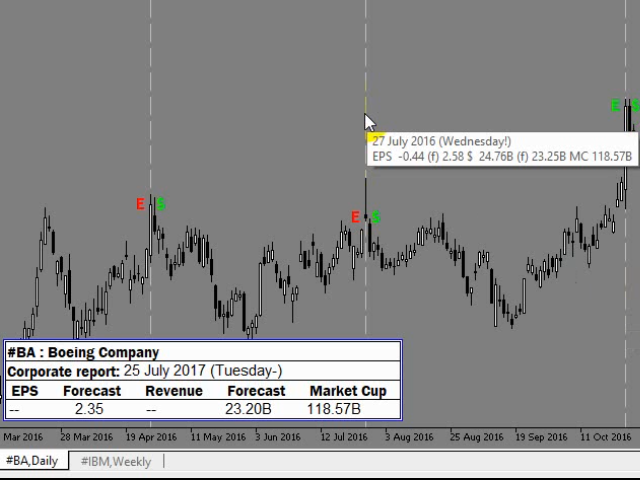 Company indicator graphs are displayed on the chart (EPS and Revenue $). 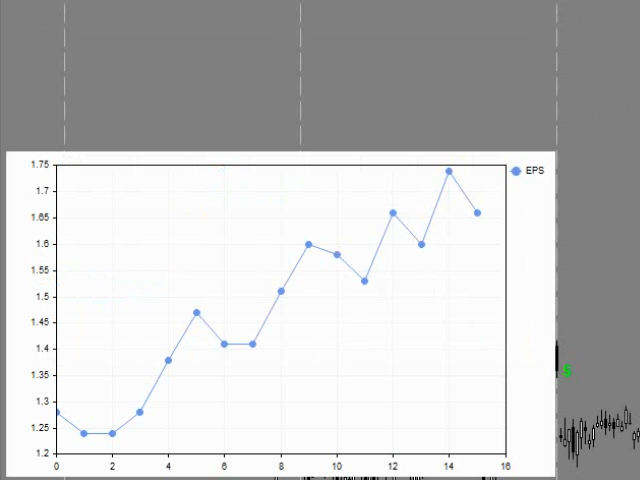 The graphs are plotted based on the downloaded reports and data present in the downloaded reports. 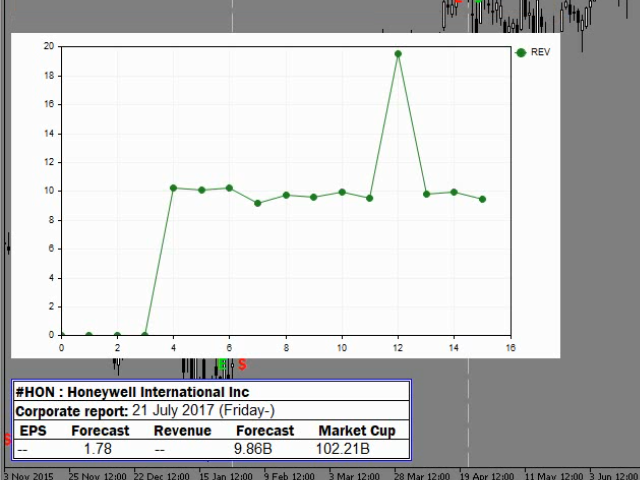 If some report is missing on the website, the graph is based on available ones. If some indicator is missing in the downloaded report, its value is assumed to be zero on the graph. The graphs can be moved or deleted. Reports located in the table at the bottom left are not considered by the graphs. Only the ones displayed as horizontal lines on the chart are considered instead. If the program is launched on the instrument not present in the list, no actions are performed. If there is a report from another company on this chart, it is deleted. The program works in English and Russian. The Comments section contians the list of countries and the the Ticker List file specifying all instruments the program works with. Add URL https://investing.com/earnings-calendar/Service/getCalendarFilteredData to the list of allowed URLs. Options -> Expert Advisors -> enable "Allow WebRequest for listed URL". For more convenience, assign a hotkey to the script: right-click Corporate Report in the Navigator window -> Set hotkey -> select a suitable combination. 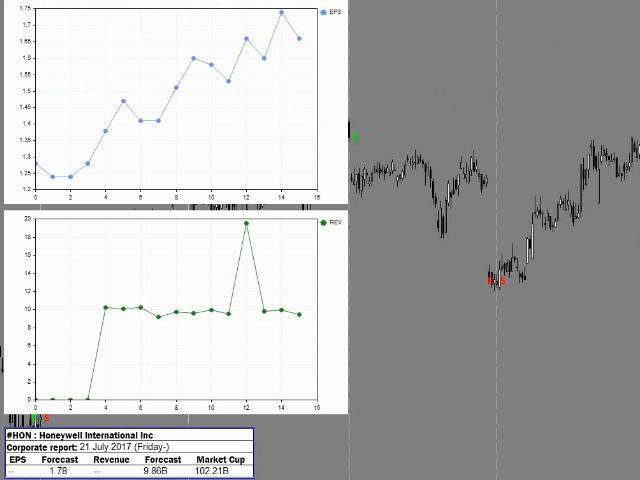 The monitor vertical resolution of 900 or more is recommended when using the program for more comfortable trading. The program and all the information used in it depend on the investing.com website. 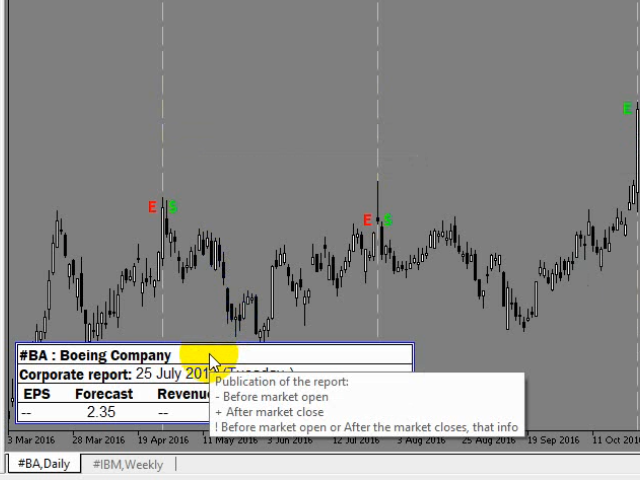 The script operates till it is able to receive data from https://investing.com/earnings-calendar/Service/getCalendarFilteredData programmatically. Fixed an error that could occur if the broker's server was missing a history for a certain period of time on the requested instrument (but which should certainly be available).